We understand the complexity of the Social Security Disability Insurance application process, and we will make every effort to ship this item as quickly as possible. Compiled and written by Douglas Smith, Attorney at Law, and produced by Physicians’ Disability Services, Inc. 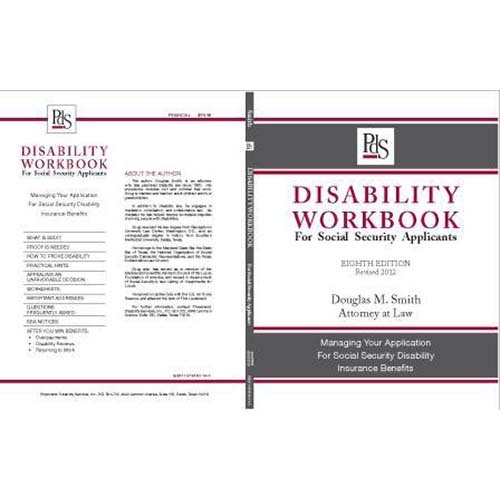 This brand new 8th edition of the PDS Disability Workbook is an invaluable guide to understanding and navigating the Social Security Disability Insurance (SSDI) system. Used by thousands of people who have needed help filling out and filing disability insurance claims, the 130-page workbook includes an appendix with the most recent changes to the SSDI regulations. The text includes chapters on what SSDI is, how the application process works, how to prove disability, and how to appeal an unfavorable SSA decision. The workbook contains work sheets, a “frequently asked questions” section, information on various Social Security Administration publications, and a section on what happens after you win benefits, including: overpayments, disability reviews, and returning to work. There is also an updated discussion of the pros and cons of applying for Social Security Disability benefits online. An LFA Seal of Approval book.